CS informed that all the deemed projects of Arunachal Pradesh will likely be launched and inaugurated by PM Modi on his visit. The review meeting was chaired by Chief Secretary Satya Gopal in presence of S. Suresh IG (Special Protection Group), CEO Kaling Tayeng, IGP Sunil Garg, senior State Officers. Representatives of other stakeholders like NEEPCO, CPWD, BSNL and Doordarshan were also present in the review meeting. 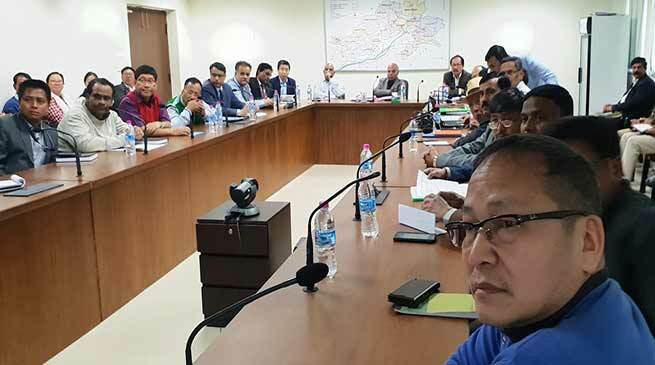 Chief Secretary took detailed stock of all the arrangements being made for the visit of Prime Minister to Itanagar and has asked all the concerned departments and stakeholders to put forth their best effort to make the visit a grand success. CS informed that all the deemed projects of Arunachal Pradesh will likely be launched and inaugurated by Prime Minister Narendra Modi on his visit. The Prime Minister is likely to visit Itanagar to inaugurate and lay foundation stone plaques of 9 most coveted projects in Arunachal Pradesh, namely, lay Foundation Stone of New Green Field Airport Holongi, inaugurate Retrofitted Airport at Tezu, launch of DD ‘Arun Prabha’ Channel, foundation stone of Film Television Institute Jote, inaugurate 50 Health & wellness Centres Itanagar digitally, foundation stone laying of Seven 132KV and Twenty Four 33 KV Substations under Comprehensive Scheme for Strengthening of Transmission & Distribution System, dedication of 110 MW Pare Hydro Electric Plant, declaration of 100 % Households Electrification, foundation stone laying of Sela Pass Tunnel and Approach Road. Prime Minister Narendra Modi will also address a public rally at Indira Gandhi Park, Itanagar during his visit.